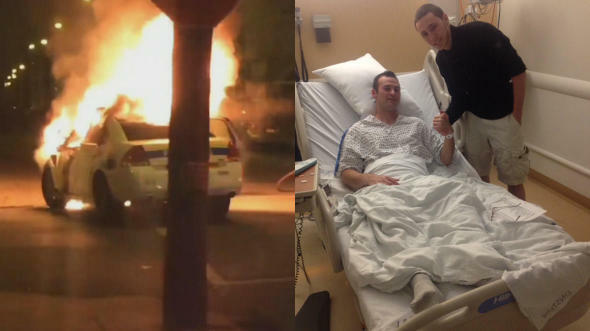 A young Philadelphia firefighter rescued a trapped cop moments before his police cruiser burst into flames. The sound of a car crash interrupted a Saturday night episode of “Cops” and instinctively brought Joe Chambers, a 17-year-old volunteer with Leedom Fire Company, outside to investigate. He sprinted at the sight of a banged up cruiser at the intersection of 28th and Tasker St. only to find witnesses gawking at a delirious Officer Mark Kimsey, who was unable to move as the hood caught on fire. The driver of a black pickup truck had just broadsided the officer’s vehicle, denting the driver’s door shut. Kimsey managed to radio in the accident, but slipped in and out of consciousness as Chambers called for help to get him out. “I told him, ‘You’re going to have to come out through the window,’” Chambers told the Daily News. The senior at Ridley High School and another good Samaritan reached inside the car even though it could have exploded into a ball of fire at any second. The fire took less than a minute to engulf the seat where Kimsey had been trapped and only four minutes to spread to the rest of the car. He then turned his attention to the unconscious driver in the truck and helped him to safety. Chambers later visited Kimsey at the Hospital of the University of Pennsylvania shortly after being treated for minor scrapes where they posed for a photo together. Both the driver and Philadelphia officer are in stable condition. Kimsey hurt his head when the airbag burst open. 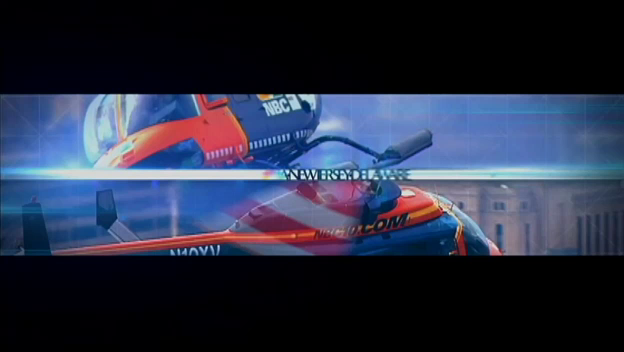 His legs had also been burned in the accident, according to a WCAU-TV report. The officer’s agency is now calling Chambers and other bystanders heroes for pulling him out of the vehicle. “A uniform doesn’t make a hero, courage and bravery does. A few young men saved a Philly police officer and citizen,” Philadelphia Police spokesman, John Stanford, wrote on Twitter. Chambers visited Kimsey in his hospital room later Saturday night. Chambers has been a volunteer firefighter with the Leedom company for the past three years. He plans to join the Marines or Army after graduating from high school, he told the Daily News, but eventually will pursue his life dream of being either a police officer like the one he rescued or returning to firefighting.